Sue has been practising Yoga for over 30 years. She follows the teachings of T Krishnamacharya and TKV Desikachar, which emphasise the importance of a step by step approach to individual development using Patanjali's yoga philosophy, physical postures, coordination of breath with movement, breathing practices, visualisation, sound as means to focus the mind. She is a practitioner member of TSYP and aYs. She holds a British Wheel of Yoga Teaching diploma and Foundation Course Tutor certificate, a KHYF/TSYP certificate in One to One tuition, in Yoga Therapy from Dr N Chandrasekaran of Yoga Vaidya Sala and in Ayurveda from Sadhana Mala. Sue also runs workshops on Vedic chant and the Yoga Sutras of Patanjali. Weekly group classes in the Barn at Millers Farm. All levels of experience are welcome as classes are modified to suit all abilities. Bring a mat and blanket and wear loose clothing. The barn at Millers Farm has underfloor heating with views out over the fields. Classes are limited to 10 or 12. Discounts are available if you pay for the term. Email for term dates, further information and to book your place. Individual tuition, Yoga Therapy and Ayurveda Individual teaching is the traditional way of Yoga for those who wish to develop a personal practice at home. A one to one relationship with a teacher is invaluable and a great opportunity to explore the benefits of yoga more deeply than in a group class. It can help a person of any age, level of fitness or state of health to recognise patterns in movement, breathing, diet or lifestyle which may be causing poor posture, stress or illness. A teacher trained in the Krishnamacharya tradition uses the tools of Yoga to help change these patterns and to optimise health. If a person has serious health problems, Yoga Therapy and Ayurveda may help to relieve pain, improve breathing, mobility, coordination, digestion or sleep and may ease anxiety or depression. Movement with the breath, relaxation, sound and visualisation are used as appropriate in modified forms to suit the individual. A regular home practice helps to overcome the effects of illness, assisting in a greater sense of self empowerment and well being. One to one sessions are held in the Barn at Millers Farm or occasionally in a person's home. A free half hour introductory consultation will assess general health, diet, sleep, work and leisure habits. From this strictly confidential information, Sue will plan a one hour lesson and a simple home practice which will include a combination of the tools of yoga; whatever is appropriate to the individual's needs. 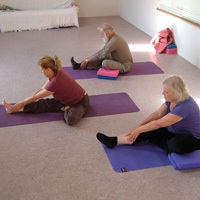 It is important that the person is committed to a short regular practice at home. This will enable her/him to become aware of, and change, patterns of movement, breathing, diet or lifestyle and help the teacher to see how the practice is working. At each subsequent lesson, the practice will be revised and adapted to suit development as it arises. Lessons are generally spaced 2 - 4 weeks apart and cost £40 per hour when held at Millers Farm. Prices may vary at other venues according to space rental and travel costs. Next dates to be announced. Please email for further information, to express an interest or put your name on the waiting list. This is an ideal course if you wish to deepen your understanding of Yoga, as a tool for self development or as preparation for Teacher Training. Bespoke Yoga Breaks can be arranged. 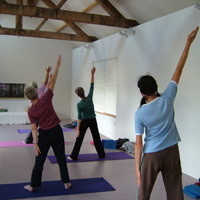 Staying at Millers Farm in the barn's self-catering accommodation may include personal yoga lessons programmed to your timetable - early morning, pre-lunchtime, early evening or late practices specific to your needs, be they energetic or soothing postures, pranayama, relaxation, meditation or mantra chanting, a Yoga Therapy or Ayurveda session. Visits from local therapists can also be arranged: massage, kinesiology, herbal remedies.......And you will have time to walk in the stunning countryside or visit the main attractions in the locality. Please email if you are interested.